Trying to eat more veggies is something we could all probably put a little more effort into. Sometimes I feel like I would have to constantly be putting vegetables in my mouth just to meet the recommended daily amount. One way I try to get a head start on a few of those servings is by making a simple succotash from a few fresh veggies. For this succotash I put together what may turn out to be the last of the cherry tomatoes from my garden with some corn, lima beans and green onion to make a bed for salmon glazed with sweet BBQ sauce. Slice the green onions (green and white parts) and stir in with the corn, tomatoes and lima beans. Sprinkle with a little salt and set aside while you make the salmon. Rinse and dry the salmon fillets and sprinkle with a little salt. Heat the olive oil in a non-stick pan over medium high heat. Add the fillets to the pan flesh side down and cook for 3 - 4 minutes. Flip the fish over and cook for an additional 3 - 4 minutes. While the fish is cooking skin side down, use a pastry or marinade brush to glaze the flesh side with the BBQ sauce. Flip the fish over one more time to allow the BBQ sauce to caramelize just slightly. Remove from the heat and serve over the sweet corn succotash. Enjoy! Great idea for the cherry tomatoes! I have a cherry tomato plant on my balcony that has produced about 30 little baby green tomatoes over the weekend. Now just to find a way to use them green. I don't think that the plant will last until they ripen. Hi Michele! Do some baby fried green tomatoes! Slice those puppies in half and get them breaded. These would be a great little appetizer for a small party. There's a fried green tomato recipe in the tomato section of Apples and Butter. Let me know what you end up trying! 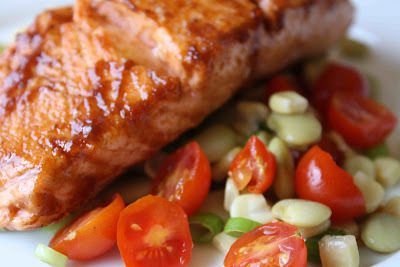 i love salmon and i love sweet corn! what a great combo! I have a tub of cherry tomatoes that need to be used. This looks like just the recipe. Yum!